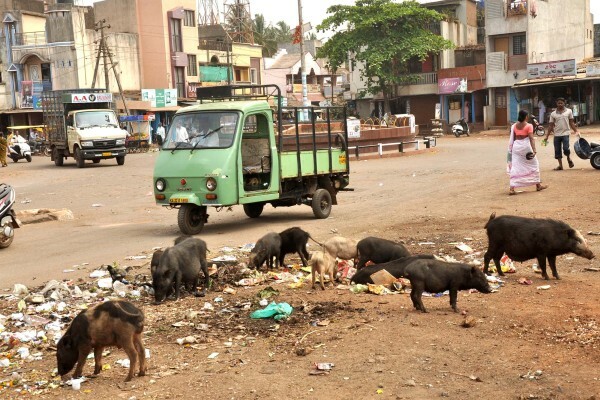 Pig menace has been causing concern among residents of several areas in Belgaum. And see this example from Ward No.15 in the city. The increasing population of pigs has raised the fear of health risks among people. Several pigs can be seen on the streets of residential areas. Pigs roam in this area throughout the day, feeding on the garbage and lying in sewage. Citizens are living in such unhygienic conditions for quite sometime. The pigs not only look scary, but they destroy all the plants and scour through the drainage on the road and make a mess of the entire area. If the residents chase them away, occasionally the pigs attack them and some can even bite. It is a huge nuisance. The corporation should look at the issue and get rid of this menace.